Posters can either be non-laminated or laminated for an extra charge. Call us on 020 7607 3361 to discuss your requirements. Old-school print work is very different from digital printing that we have today and there are a lot of additional considerations to be taken into account when designing a file that you’re going to print. Without proper planning prints can end up with borders they were not meant to have or images and text might be cut off when they aren’t supposed to be. 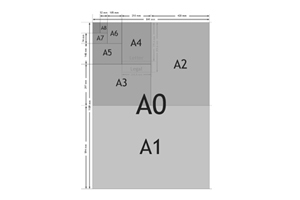 Poster printing can be particularly challenging, especially in terms of choosing the correct resolution. Generally speaking you will want to print posters at a resolution of 300DPI (Dots per Inch). This will ensure images are crisp and clear and that the typography presents well. In the case of much larger posters, it is okay to print as low as 150DPI, but you will want to print in as high a resolution as possible in most cases. A0 poster size prints measure 84.1 x 118.4cm (33.11 x 46.61 inches). These are typically movie posters that would be on display outside a cinema, music venue or theatre, A0 size posters are usually okay to print at 150DPI. The A1 poster size prints measure 59.4 x 84.1cm (23.39 x 33.11 inches). These are usually display posters that you can get from music and movie stores. These are fine to print at 150DPI as well. The A2 poster size prints measure 42.0 x 59.4cm (16.53 x 23.39 inches). These are typically the sizes for bedroom posters or “wall scrolls” and can be printed at 300DPI. The A3 poster size prints measure 29.7 x 42.0cm (11.69 x 16.53 inches). Because these are smaller in size and won’t be viewed at a distance they should be printed at 300DPI. These are suited to advertising events such as live performances. The A4 poster size prints measure 21.0 x 29.7cm (8.27 x 11.69 inches). A4 size prints are usually tear outs in magazines or as flyers, and should be printed at 300DPI. In general when designing and printing posters, consider the size and the distance the posters will be viewed at. Posters that will be viewed from further away can be printed at a somewhat lower resolution without the viewer interpreting a major loss in quality or detail.